We received a phone call at ChiFi at around 04h40am asking for help "because you were so good after the floods last year". After attending to another urgent matter in the morning, UMashesha Mitta Lebaka and Frank Kum drove to the scene. "It was about 2am when I woke up. I was confused as to what was happening. In my mind I kept on thinking that it was a dream and I was going to be told to wake up" said 52 year old woman, Rose Myeni. "Our home was a brick built home where four families lived. I lived with my two sons (17-year-old Paul and 20-year-old Lucky Myeni). The two who died in the accident were a young couple," Rose added. Esther Koos member of a political party living in the same area said: "It was allegedly a candle that caused this (pointing at the house). I do not believe that a candle can cause so much damage in a short space of time. I believe it is more" said Koos. Esther took fellow UMashesha volunteer Frank Kum and I to see what the house now looks like. 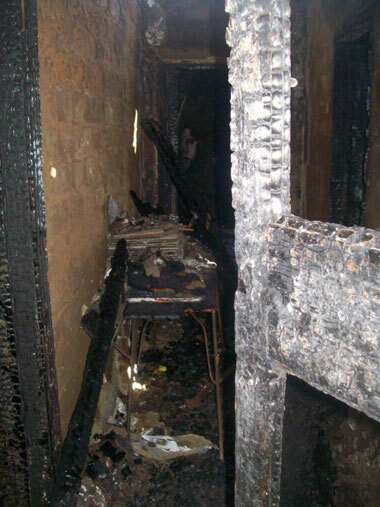 When asking other people about the fire, it was alleged that the candle was left alight by the couple next to the couch. Then somehow the two teenagers who were in the same room as the couple managed to escape and the couple could not. According to Rose, when she woke up, there was no sign of whom or what might have started the fire and where other people were. But the later when some family members arrived, it was alleged that the reason why 31 year old male Vusi Sithole and his 26 year old girlfriend Boitumelo "Tumi" Moseki burned to death was because in the confusion other people thought they saw them outside. That is why they did not stress about looking for them in the house. Then just when someone made that statement, it also alleged by another resident that the couple might have been targeted by someone and that is why they were left inside to die. I thought this person was not doing anyone any good because the families were emotional enough, they did not need to be fuelled by a person making immature statements. I could not get Rose to answer most of what I needed her to answer, so I decided to go and see other people who were around. Before I left, I asked Rose how old she was and she said she did not know and passed me to her daughter hoping she might know and the daughter passed me back to her mother. I asked Rose when she was born and she said 1959 and that is how I got to figure out her approximate age. When I was going to find other families, I heard a woman crying out loud saying in Zulu: "Nkosi yami��" (my God). She was from Tumi's family and she could not stop going inside the house. 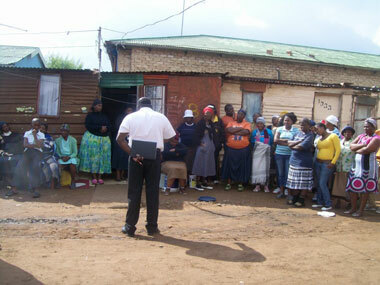 At that time Vusi's family had not arrived yet and the public was wondering if he had any family. Pam Sibanyoni the candidate councillor of the African National Congress for that ward, said she had already been to Vusi's family home with her other colleagues earlier in the morning and the family were due to arrive at any moment. Just when she was talking about them they arrived. Vusi's mother needed no explanation as to where her son could be. She knew somehow that he had died. She ran like crazy to the house despite the smoking ground where the house was; she went in and cried. The rest of the family stood outside trying to inspect the building. Vusi's aunt said she did not understand why he was there, because he had said that he was going to move out and come back home. His sister wailed that her brother did not deserve to die the way he died. Soon after there was a realisation that both families had arrived and a meeting was called. It ended when a decision was made that there would be a proper meeting at one of their homes where they will decide what to do. By this time the Sowetan newspaper had just arrived. For the first time I saw a journalist giving people time to talk and then asking those emotional questions that journalists like. Ntoagae a reporter from the Sowetan asked to speak to Disaster Management in the meantime. Because I was standing next to Jerry Selebogo of Disaster Management, I said also would also like to have a word with him because I was from a charity and we were there with disaster relief supplies. Ntoagae talked to me after he was done with Disaster Management and both families. I continued with my search for another resident who was directly affected by the fire. 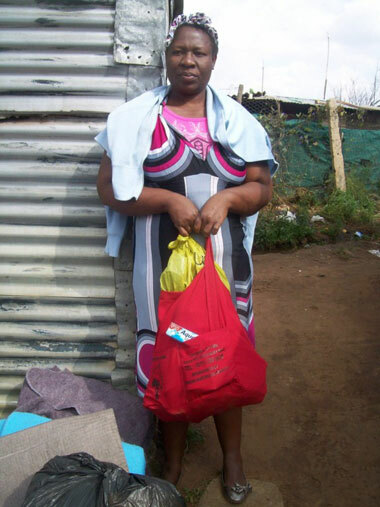 I found a thirty-seven year old woman named Mumsy Mashele who also lost everything. She said all she remembered was when she was suddenly awoken by people screaming and all she knew was that she needed get out of the house. She said in her mind she was not thinking about anyone or anything, just how to get out. She said she did not want to say what did and did not cause the fire because she did not see it start. She lived with her sister Fancy Mashele aged 34, Fancy's daughter six-year-old Lesego and her daughter Lethlogonolo aged 13. She said she was glad that the children who were in the same room as the deceased couple somehow managed to survive. They were taken by the Johannesburg Emergency Services (EMS) for trauma counselling. There was nothing I could say to her other than that we had brought blankets, clothes, tinned food and more to help them get back on their feet. I said we would give the items out shortly. Frank by this time had been inside the house and taken a few pictures. He came up to me asking if I wanted to go inside the house and see what damage was caused by the fire. I said I would go in with him but a man who overheard us talking said: "you are going there at your risk. If you get hurt we are not responsible" this man said. Neh�.. I thought; he had a look at me and assumed that I could handle seeing the house because I am also burnt. I said I was going in and I understood that. 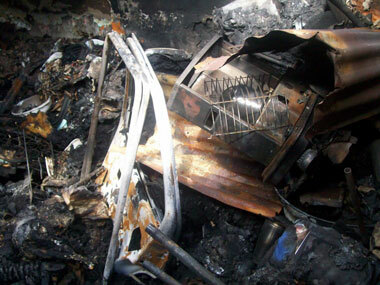 When I walked inside the shell of a house, I could not believe it was just a candle which caused the fire. Going to the next room where the couple had slept, I saw a gas cylinder. Frank thought the gas might have also played a major role in spreading the fire. He was saddened the whole situation, especially the children who were in the same room as the couple. When Frank and I were still in that room where the ash-covered floor was still smoking, Vusi's sister walked in. She said that her brother did not deserve to die the way he did. She was really hurt and all I could do was to help her go out of the room and take her outside. I could cry with both families nor even say words of wisdom, because from experience, I have learnt that when you are in that situation of losing a loved one you do not hear all the "sorry" and the "I know you are hurting" of people who might or might not know what you feel like. So I was not going to "lie" to her and say that I understand. In reality I do, but emotionally, it's a different story. 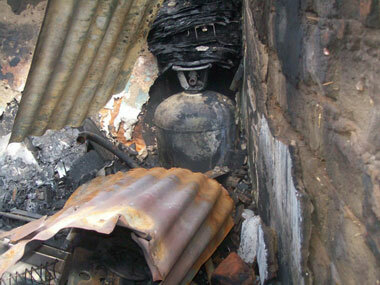 In the debris of the fire there were burnt-out paraffin stoves, gas heaters and gas cylinders. There was no working electricity in that building. The railway runs past the house with no fencing at all. Children grow up surrounded by danger. Frank and I went to the car to sort out what we had and to make sure we were going to give to the people who needed relief. Pam, Theo, Sibongile and Esther all members of the ANC came to assist. I was surprised at how well we worked. We shared the blankets, tinned food, FIFA shirts and Children of Fire's Disaster Recovery bags equally to the deserving families, leaving nothing not-handed-out. Pam Sibanyoni said she would like to thank Children of Fire for its great work and to Bronwen Jones. Disaster Management had not brought anything yet but was surprised at how much we brought. "We need to work together" said Jerry of Disaster Management. We gave books to the children who gathered out of curiosity. They were really malnourished and they enjoyed a story that I read to them just before we left. After I read the story titled "Fred's birthday" in English and translated it to Zulu, a seven year old boy named Nkosingiphile said he wanted a birthday as well! His birthday was on the 19th April. 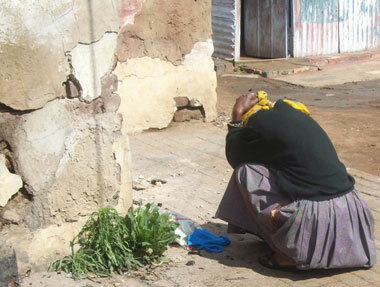 Vusi Sithole's mother crouched in grief. 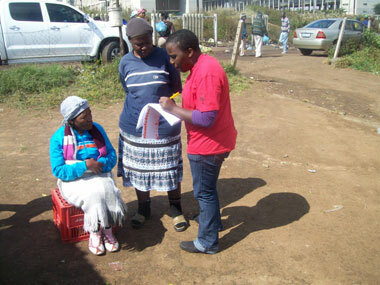 Mitta collecting information from fire survivors Rode Myeni (52) seated, Fancy Mashele (34) standing. EMS offered prayers but the people wanted safer houses.